The acclaimed sci-fi action-adventure series MOTOR CRUSH is back for another heat! Two years have passed in Nova Honda, the racing capital of the world, and for Domino Swift everything has turned upside down. How does she fit in a world without Crush? Collects issues 6 through 11. 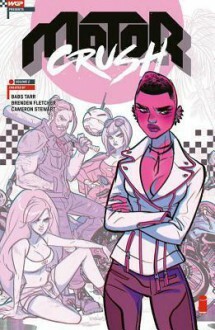 The acclaimed sci-fi action-adventure series MOTOR CRUSH is back for another heat! Collects issues 6 through 11. Dom returns after two years to re-acquaint herself with friends, lovers, rivals and the world that she left. Lots of action and a certain finality to the plot. I found this more entertaining than Volume 1 but I’m not too enthusiastic about the cartoony artwork.